Comprehensive review of Tantowel Self Tan Towelettes. See what real experts have to say about this self tanning product. We are excited to be reviewing Tantowel Self Tan Towelettes. What a novel idea though, to create individually-wrapped towelette that’s easy to travel with so you can touch up your tan whenever need be. However, the experience didn’t live up to the hype. Now, we love the compact, easy-to-carry packaging of Tantowel Towelettes. They are very easy to apply, practically mess-free, and dry instantly. But, we were let down by the lack of “tan” that Tantowel Towelettes left us with. One Tantowel was not sufficient enough to tan my entire body, I had to use 2 and probably could have used a 3rd. It will cost you about $27 for 10 towelettes. That averages out to about $2.70 per towelette. If you’re really tiny and can limit yourself to only using 1 towelette per application this box will last you about 3-5 weeks. But, if you are average or voluptuous and need more than 1 Tantowel per application, you’ll be lucky if this box lasts you 2 weeks. Overall, we gave Tantowel Plus Towelettes 2 out of 5 stars. A below average rating for, what we feel, is a below average product. Tantowel Self Tan Towelettes are individually pre-packaged for convenience. The white towelette folds out of the plastic wrap easily, it reminds me of the wet naps that you get after you eat a rack of ribs, or a face wipe towelette that is used to take off makeup. I expected the towelette to be a darker color, or at least change colors during application but it stayed white the entire time. The instructs you to apply in a circular motion over your face and body. The act of applying was really easy, and mess-free. I used gloves just in case, but honestly, you don’t need them. There’s no guide with this product, in fact there’s no evidence of instant color change at all. It’s difficult to see where you might have missed applying on your body when there is no color change. One Tantowel Towelette is supposed to cover your entire body. After applying to my torso first, I could see the towelette starting to dry out and could feel on my skin that there was nothing actually being applied at that point. Tantowel Towelettes dry almost instantly. I could feel the product soaking into my skin right away. Within 5 minutes I felt completely dry. The quick dry time is definitely a plus for “on the go” tanners, or those who need to use the towelettes for touch up throughout the week. Tantowel Self Tan Towelettes have a light citrus smell. Almost like a wet nap…..more and more I’m starting think that I just wiped my entire body with a wet nap from Chile’s :). The citrus smell of Tantowel Towelettes lasts about 2-4 hours and then the dreaded DHA smell kicks in, and my craving for ribs disappears. The Tantowel Towelette that we used was for medium to dark skin tones. The directions say that within 2-4 hours a “natural looking glow” will be produced. And then continues to say if you want a darker color to re-apply. I felt like I could have gone through the entire box re-applying until I would have gotten the tan that I was looking for. I do notice a subtle “natural glow” but it’s not anything drastically different than when I apply my daily moisturizer. 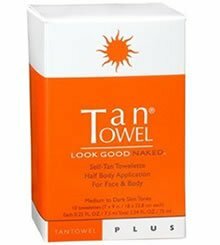 I could see Tantowel Towelettes being a good companion or used for maintenance and touch ups in conjunction with a different self tanning product. But on its own, Tantowel Plus Towelette don’t live up to the hype. Tantowel Towelette instructs users to reapply as needed or 2 to 3 times a week. If you do as instructed using 2 to 3 times per week your “natural glow” will stay consistently subtle throughout the week (5-7 days applying every other day). Yes, Tantowel Self Tan Towelettes would work for men because of their convenient and mess-free application as well as its citrus smell. However, just as we don’t recommend this product to a woman looking for a drastic change in color, we wouldn’t recommend it to a man with the same expectations either. $27.00 or $2.70 per towelette. This seems rather pricey considering that the 10 towelettes will only last between 2-3 weeks, depending on the size of the user. To buy Tantowel Self Tan Towelettes, Click Here.